First held in 1988, the annual Art Music Awards have since recognised diverse achievements by Australia's finest musicians, composers and others involved in the presentation of Australian music. As a measure of their appreciation to the people who had worked so hard to make their music heard, the prizes for these early Composer Awards included works specially created by composers such as Richard Mills, Peter Sculthorpe, Carl Vine and Michael Smetanin. In 1989, a second group of awards was introduced. In addition to the Composer Awards, Critics Awards were also presented to composers - in recognition of outstanding works premiered during the previous year. These Awards were judged by music critics from major papers in each state. As well as highlighting the achievements of organisations and individuals in the Australian new music scene, the Awards help raise the public awareness of new classical composition. By its second year the event was picked up by newspapers, radio, and television in each state, even making the front page of The Australian. By the 1990s the Awards were also attracting the attention of prominent political leaders. In 1997 and 1998 the event was hosted by Premiers Jeff Kennett and Bob Carr respectively, in private function rooms in Melbourne and Sydney. In 1990 Hazel Hawke attended the Awards as Sounds' patron. 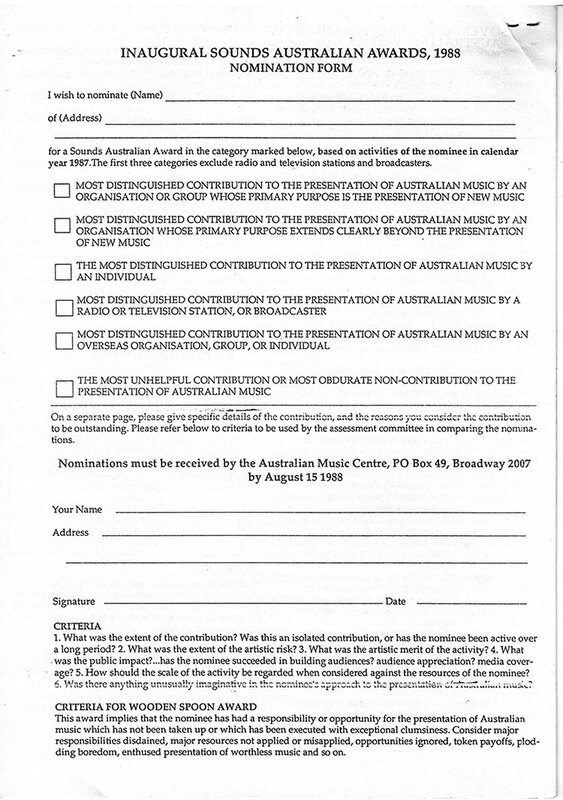 Due to funding cuts to the Australian Music Centre in 1993, no Awards were held from 1993 to 1995. In 1996 the Awards were resurrected under the leadership of the General Manager, John Davis, and restructured to reflect and acknowledge the diversity of activity in the new music scene. In 2002, the AMC and the Australasian Performing Right Association (APRA) joined forces in presenting the Awards - now called Classical Music Awards. New categories were added for works receiving extensive performance and broadcast. Another restructuring of the Awards took place in 2011 (no Awards were presented in 2010), when the AMC and APRA AMCOS together presented the first Art Music Awards. Some new categories were also added to acknowledge excellence in jazz and experimental music. Today, these Awards are still the only Awards specifically for the new music scene in Australia.